New York: Until the modern ages, Europeans viewed India with a mix of enchantment and exoticism. This fascination is evident in the maps drafted by European explorers and scholars, among other documents. From antiquity to the Renaissance, the main source for Indian geographic information came from the Hellenistic cartographer Ptolemy’s Geographia. During the 15th century, the dawn of exploration coincided with the invention of printmaking, and revolutionized methods in cartography. 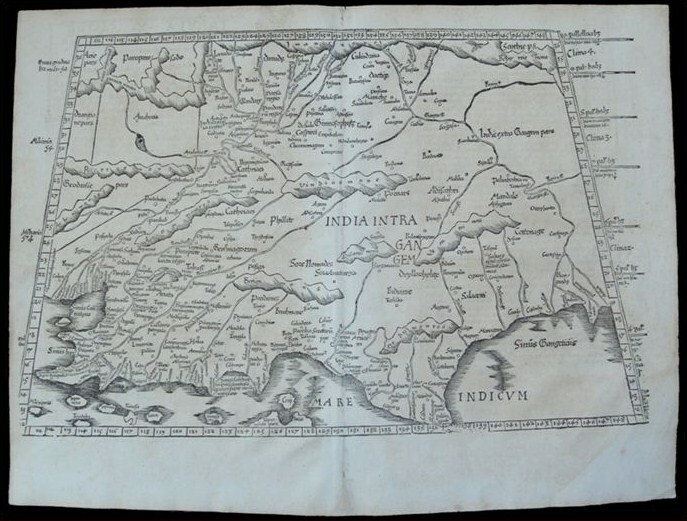 The magnificent maps of India included in the collection Imagining India on The Story by Saffronart date from 1525-1619. These documents chart changing European perspectives on the subcontinent – from a strange, misshapen land to a valuable center of trade for the West. Originally, there were 1,000 copies of most of these maps, but the majority did not survive over the centuries. Half science and half myth, these beautiful artifacts are both art objects and historical resources. For half a millennium, they represented India as a realm of the exotic, ever since Alexander the Great’s campaign first reached the peninsula in the 2ndA.D. The earliest accounts of Indian geography were crude and rudimentary at best. Ptolemy poured over manuscripts at the Library of Alexanderia and complied the eight volume Geographia without setting foot in India. 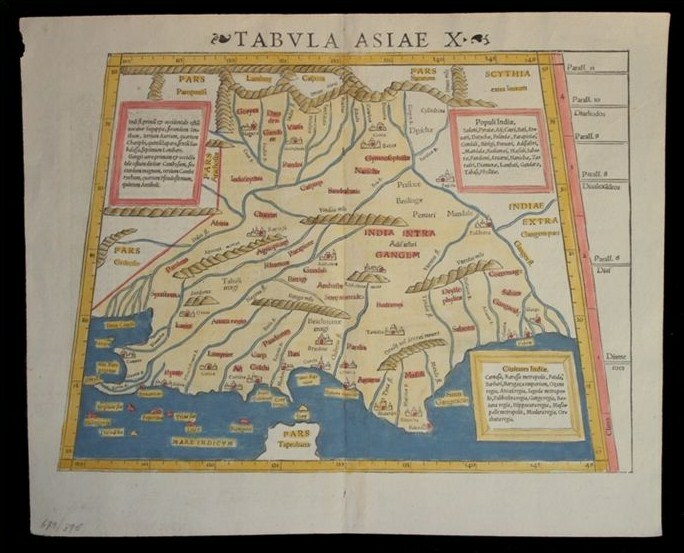 Well into the 16th century, scholars and mapmakers still relied on Ptolemy’s drafts for printing atlases. The German cartographer Sebastian Munster (1488-1552), featured in the collection on The Story, published editions of the Geographia where India’s southern peninsula was nonexistent. This reflected the fact that Alexander’s armies did not venture beyond Northern India, and the South remained unfamiliar to them. 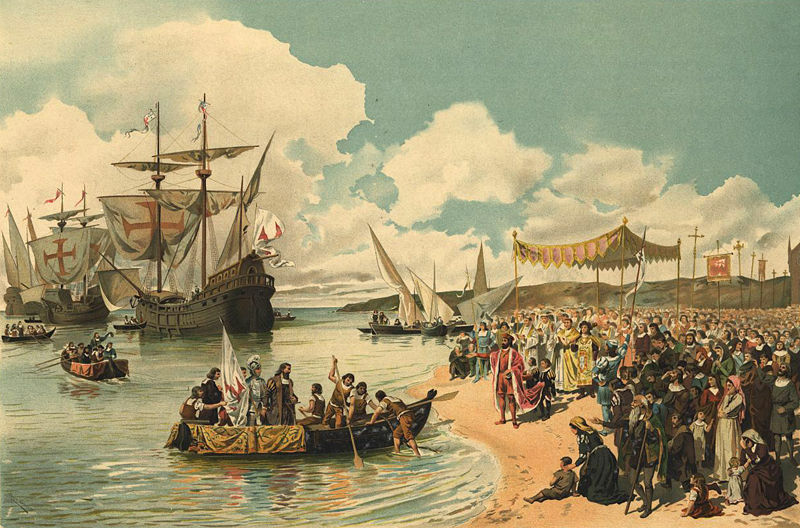 The Age of Discovery brought Vasco de Gama to India in 1497. Soon, the European concept of ‘India within the Ganges’ began to broaden and a realistic image of the Indian landmass began to circulate among scholars. 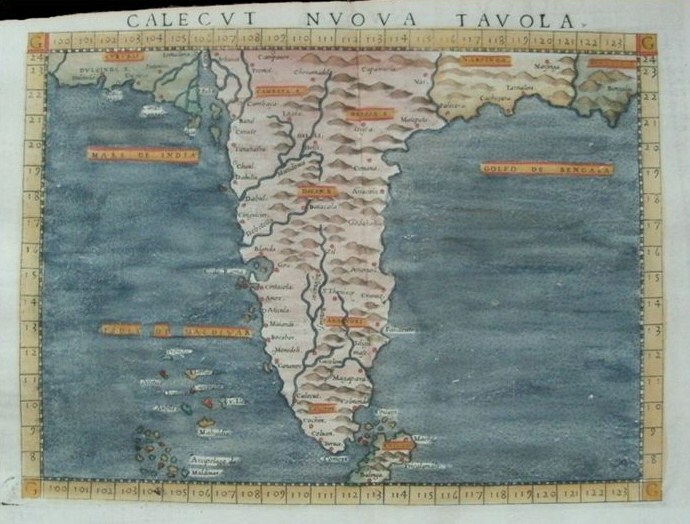 Jacobo Gastaldi (1500-1566), a Venetian cartographer featured in the collection on The Story, was among the first to bring a modern image of India to Europe. His engravings show for the first time the considerable length of India’s peninsula. Gastaldi also pioneered other pinnacle developments such as pocket size atlases and the use of copper engravings in mapmaking instead of traditional woodcuts to bring out greater detail and finesse. The maps in the collection on The Story are more telling than one presumes. By simply surviving through the centuries, they give a chronological account on how Indian geography changes in the eyes of Europeans though discovery, science and innovation. Nevertheless, what remains at the core are beautifully executed engravings that showcase the skill of a craftsman and the imagination of an artist.